Those are the words of Dr. Garth Davis, MD – a board-certified surgeon – who specializes in bariatric surgery in Asheville, NC. Prior to moving to Asheville in 2018, Dr. Davis was the medical director of the Davis Clinic at the Methodist Hospital in Houston, Texas. A graduate of University of Texas in Austin, and the Baylor School of Medicine, Dr. Davis completed his surgical residency at the University of Michigan. A self-proclaimed proteinaholic, Dr. Davis bought into the whole more is better when it comes to protein and that animal protein rules, until he applied for life insurance in his mid-30’s and found out through a blood test that his cholesterol was “through the roof,” as was his blood pressure, triglycerides, and liver functions. Instead of accepting his fate and taking medication to treat the symptoms, Dr. Davis started asking the deeper questions and specifically how his lifestyle was influencing his health. Questioning the idea that protein is supposed to make us healthier (why is everyone so unhealthy and on medication? ), Dr. Davis started educating himself on nutrition by reading the scientific medical studies. The evidence was overwhelming that a whole grain plant-based diet with little or no oil was the healthiest diet to prevent heart disease, Type II diabetes, high blood pressure, cancer, and a host of other lifestyle induced illnesses. And, so he wrote “Proteinaholic” – a book about how our obsession with meat is killing us and what we can do about it. Anyone who knows the basics of biochemistry or physiology will tell you that energy comes from carbs or fat, not protein. If protein is the answer, why is the population of the United States some of the most unhealthy people in the developed world? If you think that Atkins or Keto is it, think again. You will lose weight on these diets but they are not sustainable long-term and can be very detrimental to your health, especially your kidneys, heart, and liver. It’s a well-known fact that Dr. Atkins died of heart disease at age 68 (according to the autopsy report). Our challenge is to know what to do with information and differentiate right from wrong and we can only do this by questioning everything we’ve been told, especially by those who have a vested interest in monetary gains. Pro-protein studies are funded by the very industries that stand to benefit the most from the findings. Every consumer needs to know the research even though it is huge and varied (Dr. Davis lays out the evidence and lets you judge for yourself. Note: Not every study supports his conclusions, especially those studies funded by special interests groups like the Egg Board, The Dairy Council, the Beef Council, etc). So, it’s important to know who paid for the study, how it was done, and what the conclusions are (and these are what other scientists challenge). Chronic disease is not inevitable. Lifestyle choices matter. Presenting people with proof that their beliefs are incorrect doesn’t change their minds. Instead, it actually reinforces their erroneous beliefs, as they work hard to defend them against fact and logic. …although everyone is asking me whether a plant-based diet is really healthy, nobody ever asked me the same question about eating meat. Nobody ever said “Hey Garth, are you getting in your RDA of six serving of fruits and vegetables?” Nobody said “You know, Garth, the USDA recommends that we consume 35 grams of fiber each day, and since there’s no fiber in animal foods, you better step up those beans, grains, and veggies.” Nobody ever said “My God, Garth, your omega-6 to omega-3 fat ratios are supposed to be 1 to 1, but yours is all the way up to 15 to 1.” Nope, not a word about the well documented associations between serum cholesterol and dietary saturated fat (which every piece of meat, chicken, and fish is loaded with, as are eggs and dairy products). Sadly, conventional medicine views weight-loss surgery as the only effective cure for obesity (and this is coming from a bariatric surgeon). Surgery doesn’t treat the root cause of obesity which is the patient’s terrible diet. The vast majority of doctors prescribe medications and surgeries because they’ve been taught to combat disease this way. They have not been sufficiently educated on the power of diet and lifestyle choices (most medical schools require less than 20 hours of nutrition education with many requiring less than 10 hours). Americans spend significantly more on healthcare, per capita, than any other country in the world but residents of about 50 other countries live longer than we do. The question to ask is why? 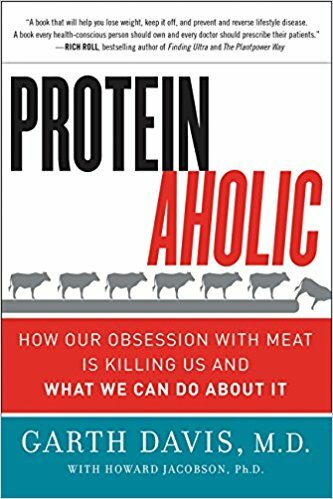 In Proteinaholic, Dr. Davis guides the reader into understanding how we got to where we are, why the proponents of protein continue to thrive, and what you can do about it. Because at the end of the day, it’s your life and the choices are yours. But, instead of promoting a vegan diet, Dr. Davis realizes the option that has more success is promote that you eat more fruits, vegetables, and whole grains, focusing on what you can do instead of what you shouldn’t do, with the idea that filling up on fruits, vegetables and whole grains will fill you up and keep you satisfied without adding more animal products. I don’t live this way to be healthier when I am old or to live longer. I have adopted this new lifestyle because it makes me feel vibrant right now.